How to Help Your Baby Sleep Better With Swaddling. Swaddling baby is a great way to get great sleep for your newborn baby through older baby. Swaddling can be a great thing to do for your baby to help have better sleep. It helps baby stay asleep longer. It also helps baby fall asleep without startling herself awake. Swaddling before each nap and before night sleep is a great part of a sleep routine to help baby recognize that sleep is coming up. Some babies won’t swaddle. Brayden wouldn’t. He fought it like crazy. Kaitlyn did swaddle, and I think it made sleep training and sleeping much easier on her. I would watch Brayden sometimes and he would fall asleep only to wake up after a couple of minutes because his arms went flying. With that said, if I had to do it all over again, I would definitely give more effort to trying to get Brayden to sleep while swaddled. Swaddling can really help a sleeping baby stay asleep. I had such success with my three daughters that I think swaddling could have helped my chronic 45 minute sleeper to sleep better. Despite the benefits of swaddling, the day does come that you have to stop swaddling. The exact age depends on your baby. Some moms swaddle up to about a year old. Others stop the swaddle closer to the 2-3 month mark. The age is for you to decide. A friend of mine who swaddled her son made the comment that she stopped swaddling at 3 months because there are so many things they work on developmentally while in the crib. This is very true (often to the frustration of the parents!). My youngest was swaddled even past six months old, though, and she didn’t suffer any developmental delays, so do not let fear of delays cause you to drop the swaddle earlier than you would otherwise. Really pay attention to your child and listen to your intuition. When Kaitlyn was 9 weeks, I tried stopping the swaddle. Prior to this she did not cry for naps. The first two naps of no swaddling, she cried over 30 minutes before falling asleep. I decided she wasn’t ready. I waited until she was a little older than 3 months old. This time there was no crying and no problems. She was ready. You might be able to slowly wean from swaddling. 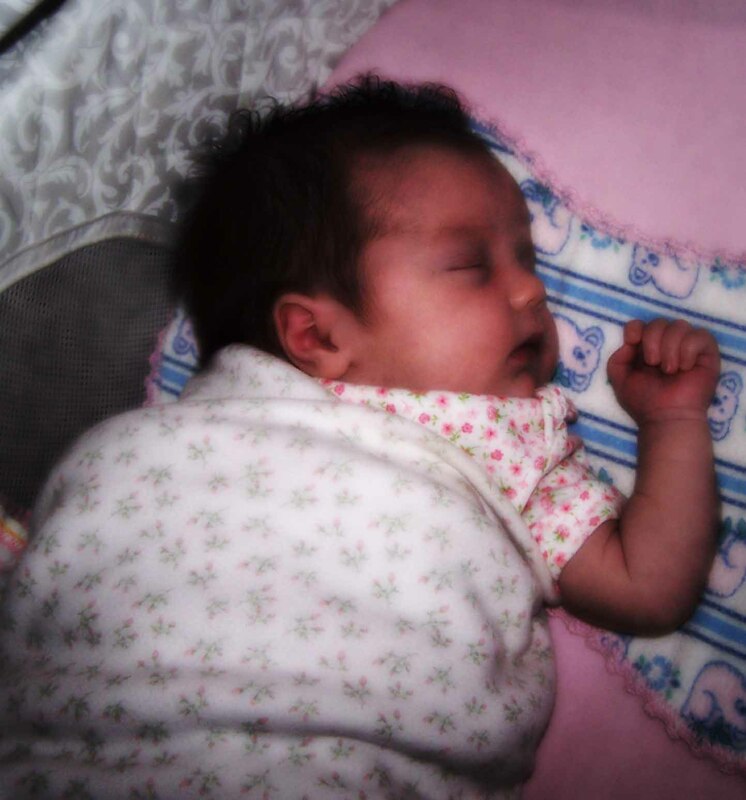 At six weeks, I took one arm out of the swaddle for Kaitlyn. After I stopped the swaddle, I still wrapped the trunk of her body for a couple of weeks. Something to watch for is improved arm and hand control. Swaddling helps prevent the jerky arm movements that wake a child up. Once they have better control over their movements, it is unnecessary and can even start to get in the way of physical skills they work on while in their beds. Once I thought Kaitlyn was getting close to this step, I made sure she had a lot of opportunity to play at her gym where she could practice those skills. The age when improved arm and hand control happens of course depends on the baby, but I would say between 2 and 3 months old, and likely closer to 3 months. Swaddling is a great tool to help baby sleep better. 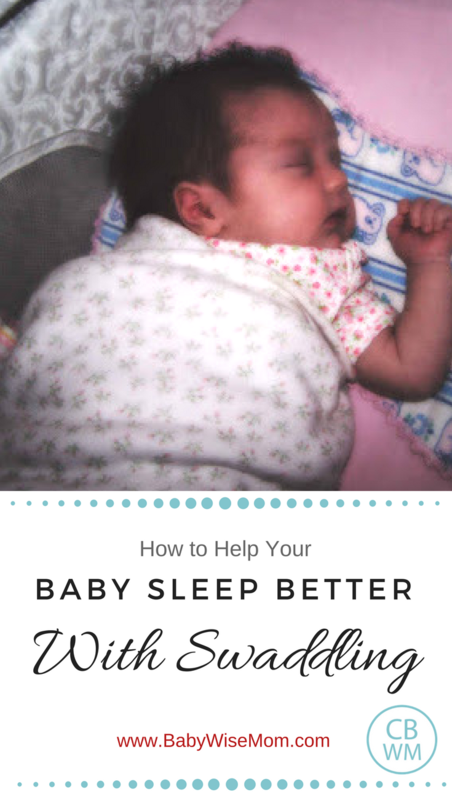 Give it a try and see if your baby gets better sleep. Poll Results: Did you/do you swaddle your baby? Just a little trick that I learned with baby number two – I swaddle her in two blankets and she never gets out! She was constantly breaking out of her swaddle during the first few days, so my husband suggested the double swaddle. I use two thin receiving blankets so she doesn’t get overheated and it works like a charm, and is way cheaper than buying special blankets. Thought I’d share that cause I know alot of people say their baby doesn’t like to be swaddled when really they just can’t keep them wrapped up. This blog is SO great! I have a random question about bundling, if any of you have any info or thoughts… Is it fine to bundle baby as long as he/she likes? My babe is 4 months and still has to be bundled. Last week he took all of his naps unbundled and slept fine–but so far this week he has had to be bundled or he won’t fall asleep. How do you know when to stop bundling? Will I run into sleep problems later if I keep bundling him now? Or do they just grow out of it? OK, thanks- you have already answered my question in a November post. I just didn’t see it! I am glad you saw it–I was just going to link it for you. Im thinking about dropping the swaddle for my 14 week old…Im so nervous because it just seems like she's getting the whole sleeping thing this last 3 weeks. I can finally swaddle her, read her a book, sing her a song, put her in the crib for naps and bedtime and she puts herself to sleep within 15 minutes.Im scared I'll "wreck" what we've worked so hard for…..any thoughts? it depends on if she is showing any of the signs of being ready. You can always try it and see how it goes. My LO is 4 months. We've swaddled her since birth, and she's always loved it and calmed down when swaddles.. Lately she was waking in the night ( she's been sleeping through the night for about a month) and her arm would be out of swaddle ( not sure if this maybe was waking her). She would start to seem uncomfortable in swaddle and maybe ready to stop. Am we've tried no swaddle, and day 1 was awful!! She got better day 2 a bit.. Naps and night time sleep is not back to normal. Shorter naps and waking .. Do you think this will adjust back to what she was doing before and it takes time?? Praying for more sleep! Day 3 no swaddle..